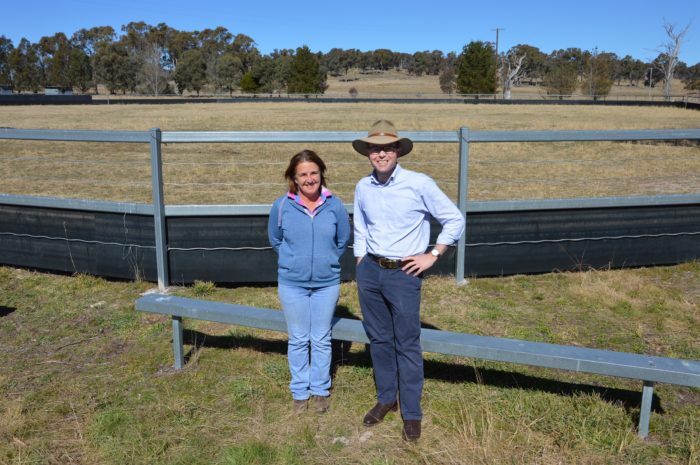 Northern Tablelands MP Adam Marshall, right, and Emmaville Deepwater Pony Club Secretary Teresa Klingner are excited about news of the $11,500 upgrade of the Dundee Sportsground. YOU can lead a horse to water – but Northern Tablelands MP Adam Marshall has announced today that Dundee will go one better, with $11,500 in NSW Government funding to build a new watering system for stock and horses at the Dundee Sportsground. The planned upgrades will include a two-tank articulated water system constructed on the newly built canteen, with new piping to extend supply to the ring and to new troughs to the cattle yards. Mr Marshall said that the money had been sourced from the government’s Public Reserves Management Fund (PRMF) and would provide significant benefit to the local events held at the grounds. “The Dundee Sportsground holds a wide variety of equestrian and stock events, drawing in experienced riders from across the region – yet currently has no access to reliable on-site water right around the site,” Mr Marshall said. “This is a major headache for event organisers, who have to cart water around in buckets and on the back of trailers during busy and crowded campdrafts and pony club days. Mr Marshall said he had taken the case for funding to the Minister for Lands Paul Toole, requesting that he approve Dundee’s application for funding. “I spoke to the Minister about how the limited water infrastructure at the sportsground is holding it back and how the funding would allow events there to expand,” he said. Mr Marshall said the Northern Tablelands had secured around $1.2 million from the PRMF this year for more than 20 local projects.